Mcleodganj, a small town about 10 kilometers from Dharamshala, isn’t anything like your typical hill station. Yes, there are mountains, temples, and even a quintessential waterfall, but one whiff of the air fragrant with the tantalizing aromas of fresh baking, Italian and Tibetan Cooking, and coffee, and a walk through the Buddhist artifacts-laden market are enough to transport you into another world altogether. 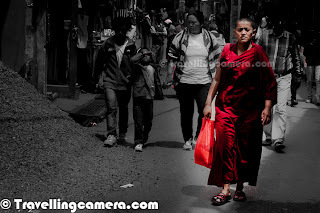 The fact that this town is also the residence of His Holiness the 14th Dalai Lama is palpable everywhere, from the narrow congested streets, receding into the heart of the town, to the Tsuglagkhang, Dalai Lama’s temple, towering over the town. In this mesmerizing town, it is easy to chance upon sights and sounds that will make your heart burst with joy. At one corner, beautiful notes of the flute played by a tourist from another country may float through the air and make you feel one with the supreme power. While in another street, the more earthy sounds of tourists haggling with shopkeepers for the fair price of a Buddha statue that has conquered their hearts make you feel connected to the world we are bound to live in. 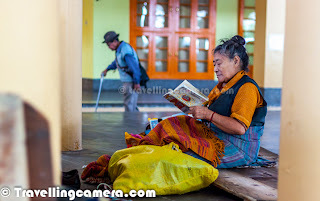 But just when you are ready to head back towards the worldliness of Dharamshala, the sight of an old Tibetan lady, her back bent with age, walking slowly and turning the prayer wheels silently makes you want to stay on just for a little while more. Besides Monasteries, eateries, and shops, Mcleodganj also holds close the Anglican Church of St. John in the Wilderness. Built in 1852, this magnificent building is nestled in the forest near Forsythganj and is surrounded by graves dating back more than a century. Reading the gravestones while walking around in the cemetery is enough to give goose bumps to even the bravest of the souls. Summers in Mcleodganj are cool while winters are very cold with temperatures dipping below zero at times. The area records the second highest rainfall in the country. So it is better to carry an umbrella and waterproof shoes if you are planning to visit Mcleodganj. The town is accessible by air, by road, and by train so getting there isn’t too challenging. 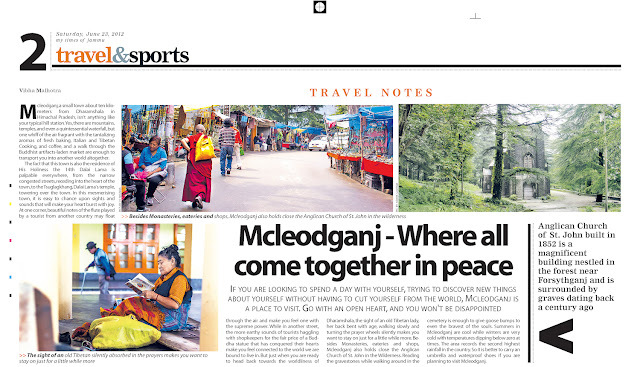 If you are looking to spend a day with yourself, trying to discover new things about yourself without having to cut yourself from the world, Mcleodganj is a place to visit. Go with an open heart, and you won’t be disappointed.